Prozak – ‘Nocturnal’ EP Now Available For Pre-Order! 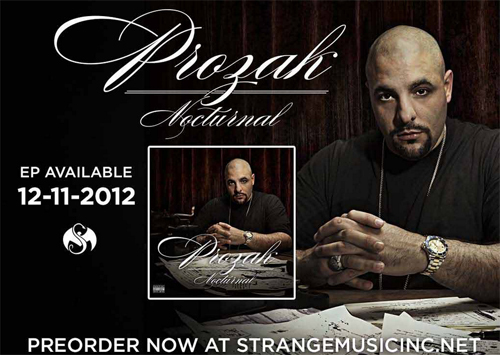 Prozak, once again, brings you into his world with his new EP, Nocturnal, available 12/11. So many fans got to experience the Paranormal emcee on the Hostile Takeover Tour and now he’s back with Nocturnal. With hard-hitting tracks like “Molotov” and “Knuckle Up”, Nocturnal will have you up ’til the darkest hours of the night. Preorder your copy today at strangemusicinc.net and you’ll receive a copy of the Nocturnal EP as well as a Strange Music Snake and Bat sticker. Click here to preorder your copy of Nocturnal, the new EP from Prozak!